A great book for adults and kids alike, about the love of reading. Actually, it’s Reading Month!! There are so many schools here that spread their Reading Weeks over the month of April, that we celebrate reading all month long. As an education reporter, I am blessed because I get to hear authors speak, storytellers perform, guest readers read, and my favorite of all: I get to BE a guest reader and read to classrooms all around our city and neighboring cities. Last I saw Katie Latimer, one of my all-time favorite storytellers, and today, I get to see Len Cabral, a storyteller that Latimer has said inspired her as well. I remember hearing him perform even when I was a child. Additionally, I also got to hear one of my daughter’s favorite authors speak to students last Thursday, Marc Tyler Nobleman, about two non-fiction children’s books he wrote about the true stories behind the creators of Batman and Superman, “The Creators of Superman” and “Bill the Boy Wonder.” Amazing, amazing stuff. Today I share with you a great book for readers young and old that was given to me last year at a Scholastic celebration of reading by one of the northeast reps for Scholastic, Jacqueline Dodge. 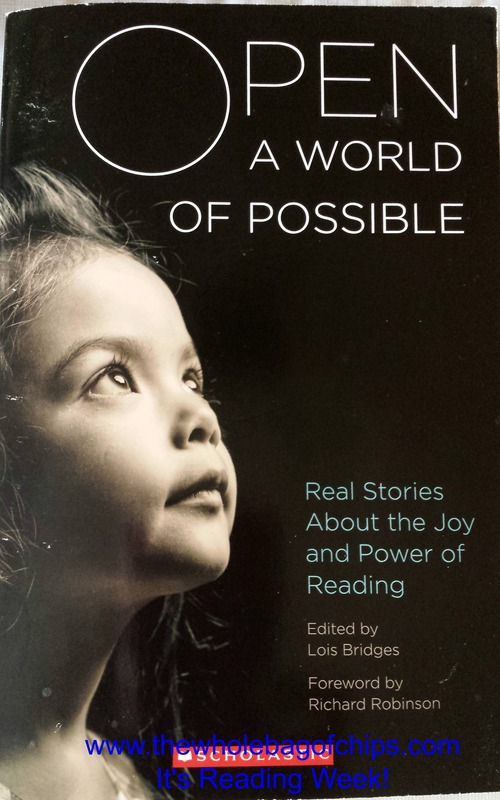 The book is called “Open a World of Possible” and it’s essays written by people who are well-known, or not so well-known and they all tell their stories of reading: why they love it, how they learned to read, who inspired their love of reading, and more. It’s a book you can open to almost any page, read a bit, and close it, returning later on to open up to a different page and read some more. It’s fascinating to read accounts that are similar to your own story, or vastly different. And yet, we all share one thing in common: a love of reading. As a parent who loves reading, I’ve encouraged the habit in my children as well, taking them to story time at our library from when they were just toddlers. We could get lost in a library or a bookstore. We participate in summer reading challenges, reading week challenges and we have tracked our summer reading just within our own family in the past. It’s a wonderful passion to have and to foster in our kids. As the book above says, reading does in fact open up a whole world of possibilities for our children. This week I will be sharing with you some books that I’ve been reading for review. I love to read and I don’t post book reviews often enough, but it’s something I’m working hard at this year. This week is the perfect opportunity to share some great books with you, starting right now. Enjoy your day and pick up a book, even if you only read a page or two!